Interchangeable Door and Desk Signs in a variety of plastics and metals. Interchangeable Signs are a cost effective way of performing a desk or door name change. These are available in a variety of finishes and sizes, our most popular being 250mm x 40mm in polished silver finish. Alternative finishes are matt black, matt silver and polished gold. Each one is produced in high quality anodised aluminium and comes in a combination of sizes: 200mm or 250mm long with depths of 30mm, 40mm and 50mm. Longer or shorter lengths can be cut to size. The door holders can be pre drilled or supplied with self adhesive backing. The inserts for the door and desk holders are made to order and offered in a variety of plastics and metals. Most customers choose the colour of the insert to match the holder but they can be contrasting. 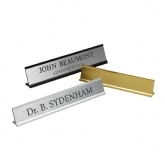 The inserts are usually engraved with either a name and job title or room name. Another option is to apply vinyl lettering to the inserts which is ideal for those offices with frequent staff changes. Using the door plate holders we can create a directory of interchangeable signs suitable for large offices and doctors and dentist surgeries.